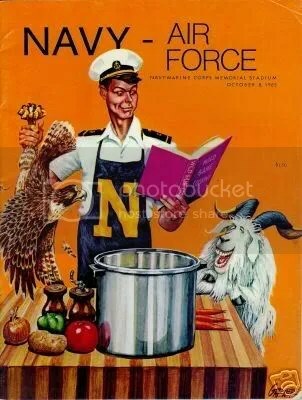 If you do, you’ll appreciate this blog entry about Army-Navy covers of years past. The Patriot League lacrosse coach interviews continue with Army’s Joe Alberici and Colgate’s Jim Nagle. UConn football coach Randy Edsall talks about Big East expansion and his desire to play Army here. No comments about why he dropped Navy, though. Wrestling recruit Bailey Whitaker was in the finals of the Tennessee state tournament, as was football recruit Jabaree Tuani-McKissack. Bill Wagner wrote about 3-point rainmaker Chris Harris. Navy baseball starts up this weekend with the Mids taking on Air Force in Millington, Tennessee. The preseason Patriot League favorites will unfortunately have to go a few weeks without the services of all-world pitcher Mitch Harris, who jammed his shoulder in an intra-squad scrimmage last week. If the Supe wants to can Herndon because he’s afraid of injuries, maybe he should consider banning home run trots, too. The lacrosse season is underway, which means that the Sun’s Faceoff blog has finally come out of hibernation. The Sun also talks about Navy’s 2-0 start here. “Well-rounded” is a nice spin, I guess. If you haven’t seen our new lacrosse uniforms yet, you can get a look here. The ESPN mothership is going to show a regular-season lacrosse game for the first time. AKA an ESPNU infomercial. Don’t tell Chet, but Paul Johnson says that he did “all he could do” at Navy. “If the Supe wants to can Herndon because he’s afraid of injuries, maybe he should consider banning home run trots, too.” – just classic. P.S. There doesn’t seem to be a navy.rivals.com or a gomids.com on rivals. According to Scout.com Caleb Campbell is another Army player participating in the NFL combine and projects as a “third to seventh round draft pick”. It’s not a ripoff if a player uses his signing bonus to repay the government for his education and it’s good PR. I don’t like that the academies are relegated to the fringe of D1 football or, as you put it, on the outsite looking in. We take our football seriously. It is time others do the same. According to FOX Sports Tolson and Campbell “could be eligible to play in the NFL immediately under a two year old plan that allows for such things.” Does anyone know what they are talking about?